Tom Davis is the Business Development Manager of Automation Services at ERMCO, Inc. ERMCO works with customers to understand their electrical, systems and automation needs. They develop innovative solutions that enable efficient design, installation, integration, and management of your power, systems and controls resources. Since the company’s founding in 1962 as a small electrical maintenance company with a staff of three, ERMCO has grown to be one of the top electrical and systems contractors in the United States. Scott Cochrane of Cochrane Supply & Engineering has the unique benefit of working with 300+ of the best systems integrators in the country. Cochrane recognizes the critical role they have within the building automation industry and is speaking with a different highly-regarded MSI each month with the goal of providing examples of industry trends, best business practices, and the growing value of an MSI. This month, he interviews Tom Davis of ERMCO, Inc. This month (September/18) he interviews Tom Davis of ERMCO, Inc.
Davis: We were driven by our desire to differentiate ourselves and move away from being a commodity. Becoming an MSI allowed us to do that. We leveraged our skill set and knowledge of open systems to better serve our clients as an MSI. Winning the 2010 LonMark Interoperable Project of the Year Award propelled us towards additional MSI opportunities. Davis: You definitely need to have a high degree of integrity to be able to do what is best for the client. Pairing this with the knowledge of all building systems, from lighting and temperature controls to access controls to utility monitoring, it positions one to be a good MSI. Of course, having a team of highly-qualified engineers and technical personnel is essential. Davis: The conversation usually begins with a discussion selling ourselves as a building automation systems contractor. The deeper the conversation goes, the sooner the client realizes that they need an expert on their team from project conception. 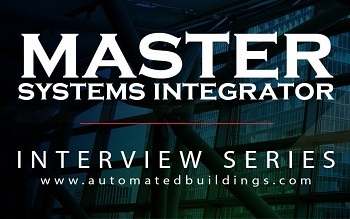 When we can show the client how they can manage their building systems differently, more efficiently and safely while improving user satisfaction, we can show them how the ROI of hiring an MSI is very favorable for them. Davis: The majority of the time it is a detailed, written proposal from us that the client signs off on. You need to have a high degree of trust between the MSI and the client. The client is trusting us with their building systems that can have a big impact on their business. In some cases, a formal contract such as those used for a consulting engineer is utilized. R&D – 45% - Keeping up on the latest trends and technologies is key to being a successful MSI. Davis: Stakeholder Education is always a big challenge because there are different stakeholders with different needs. The consulting engineer needs technical education/support while the end user needs to understand what their options are. Larger projects require multiple meetings over several months to make sure that all stakeholders have the information they need. Specifications are always a challenge as well because of the different disciplines developing them. It is not always easy to get the mechanical engineer to coordinate with the electrical engineer who should be coordinating with the technology engineer. If you are not careful, you end up with systems that are not able to communicate with one another. Davis: Yes. At ERMCO, any of the work we do as an MSI is supported by our electrical and systems services. This allows us to provide a complete, integrated solution for our clients’ needs.